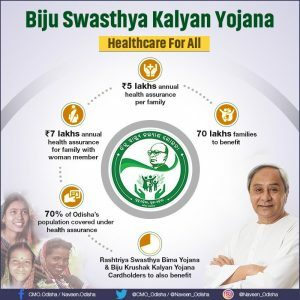 Bhubaneswar:15/8/18; Chief Minister Naveen Patnaik today launched the ambitious Universal Healthcare scheme ‘Biju Swasthya Kalyan Yajona’ on the occasion of 72nd Independence Day. The CM launched the ambitious scheme from Capital Hospital in Bhubaneswar. He also inaugurated a help desk at the Capital Hospital and unveiled the logo of Biju Swasthya Kalyan Yojana on the occasion. 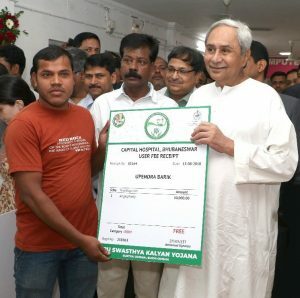 Patnaik also distributed cards to the beneficiaries of the health scheme on the occasion. 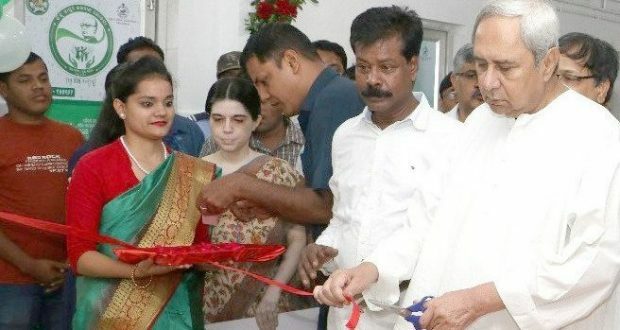 The main objective of the health scheme is to build a healthy and happy Odisha and ensure development of farmers and their families, the CM said. Healthcare assistance upto Rs 5 lakh will be provided to families under the scheme annually. Apart from that, families will be able to receive Rs 7 lakh medical coverage. Over 1 crore 2 lakh families will be provided financial and healthcare assistance under this scheme. Families whose annual income is less than Rs 50,000 in rural areas are eligible for the scheme. Similarly, the family whose annual income is Rs 60,000 will be eligible to avail benefits under the scheme. The beneficiaries will have to furnish documents relating to their income to avail the scheme. Over 70 lakh families will be benefited from the scheme in the state.